No match with ST profile. Database developed by the Centro de Investigación Sobre Enfermedades Infecciosas (CISEI) in collaboration with the Centro de Ciencias Genómicas (CCG-UNAM). This site has been funded by the Instituto Nacional de Salud Pública (INSP). Development of Multilocus Sequence Typing (MLST) scheme for the characterization of Klebsiella variicola isolates. Barrios-Camacho Humberto, Aguilar-Vera Alejandro, Beltran-Rojel Marilu, Aguilar-Vera Edgar, Duran-Bedolla Josefina, Lozano Luis, Perez-Carrascal Olga Maria, Rojas Jesús, Garza-Ramos Ulises (2017). Protocol used for MLST of Klebsiella variicola. PCR: 3 min at 96°C; 30 cycles of 1 min at 95°C; 30 seg annealing temperature (60°C or 63°C according of amplification gene); 1 min at 72°C. Following 7 min at 72°C. Each reaction contains 10ng of chromosomal DNA, 12.5 pmol of each primer, 25mM of the dNPTs, 1X of PCR Buffer, 1 unit of Taq polymerase and water to 50 ml. This page was design for assignation of sequence type (ST) of K. variicola isolates, both for Sanger- and for whole genome-type sequencing technologies. In the case of whole genome sequencing we included, first, the ANI (average nucleotide identity; see references below) analysis for proper identification of bacterial species as: K. variicola, K. pneumoniae, K. quasipneumoniae and K. quasivariicola (this last recently described). Only for K. variicola genomes will be determined the sequence tape (ST). In the other cases determines which of the other species corresponds to those included in the analysis. DNA-DNA hybridization values and their relationship to whole-genome sequence similarities. Goris J, Konstantinidis KT, Klappenbach JA, Coenye T, Vandamme P, Tiedje JM. 2007. Int J Syst Evol Microbiol 57:81–91. 10.1099/ijs.0.64483-0. Taxonomic affiliation of new genomes should be verified using average nucleotide identity and multilocus phylogenetic analysis. Figueras MJ, Beaz-Hidalgo R, Hossain MJ, Liles MR. 2014. Genome misclassification of Klebsiella variicola and Klebsiella quasipneumoniae isolated from plants, animals and humans. Esperanza Martínez-Romero, Nadia Rodriguez-Medina, Marilu Beltrán-Rojel, Jesús Silva-Sanchez, Humberto Barrios-Camacho, Ernesto Perez-Rueda, Ulises Garza-Ramos. Salud Publica de Mexico. 2018. 60;1 :56-62. 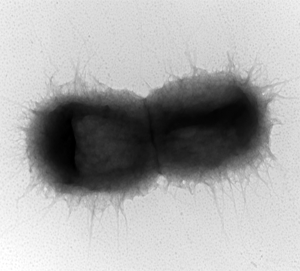 K. variicola is a Gram-negative, facultative anaerobic, non-spore-forming, non-motile rod. Its form is circular, convex and smooth colonies and grows around 11-41ºC. K. variicola was initially identified as endophyte in plants and pathogen in humans. However, according to different reports it could be considered ubiquitous in nature. According to its description in the literature, K. variicola can be found in soil, water, plants, insects, humans and animals. In all of them K. variicola plays different roles as; endophyte in plants, as pathogen in humans and animals and symbiont in insects. Klebsiella variicola and Klebsiella quasipneumoniae genomic analysis provides insights into their capacity to adapt to clinical and plant settings. Hypervirulence and hypermucoviscosity: Two different but complementary Klebsiella spp. phenotypes? Identification and Characterization of Imipenem-Resistant Klebsiella pneumoniae and Susceptible Klebsiella variicola Isolates Obtained from the Same Patient. Draft genome sequences of the Klebsiella variicola plant isolates. Draft genome sequence of the first hypermucoviscous Klebsiella variicola clinical isolate. Development of a multiplex-PCR probe system for proper identification of Klebsiella variicola. In order to function as such a resource and to maintain the quality of the data, the databases are hand curated, and all entries will be checked before final entry into the main database. To submit your data please contact the curator directly.